CHESHIRE RING WALK. Southern section – Day 4. Surprisingly another clear sunny morning, with an horrendous afternoon forecast, but couldn’t get away early because breakfast is 8am at weekends! Quick marching soon led me out of Middlewich and into rural Cheshire. The first few miles had the added attraction of the River Dane on the left, meandering at times up against the canal and then across the fields. Mock Tudor mansions with large well kept grounds were securely on the other canal bank. These expensive looking estates certainly were in prime settings – it is Cheshire – think footballers. A black mink slipped into the water next to this house. A kingfisher flashed by. As you can see from the picture starlings were doing what starlings do best, congregating in mass flight from the trees. This whole area was previously a vast salt mining site and subsidence has been a problem for the canal, in parts there are large flashes alongside creating a lake-like atmosphere. In some places the canal has had to be rebuilt altogether and the concrete sides stand out. You can see from the clouds the gathering storm. New marinas were being constructed further along and I wondered whether they were making use of these flashes.The established marinas were full of boats at this time of year. The names on the boats are a fascinating study, ranging from the whimsical…. Back to industry as I passed right through these chemical works and on past the old Lion Salt works which is now a museum. 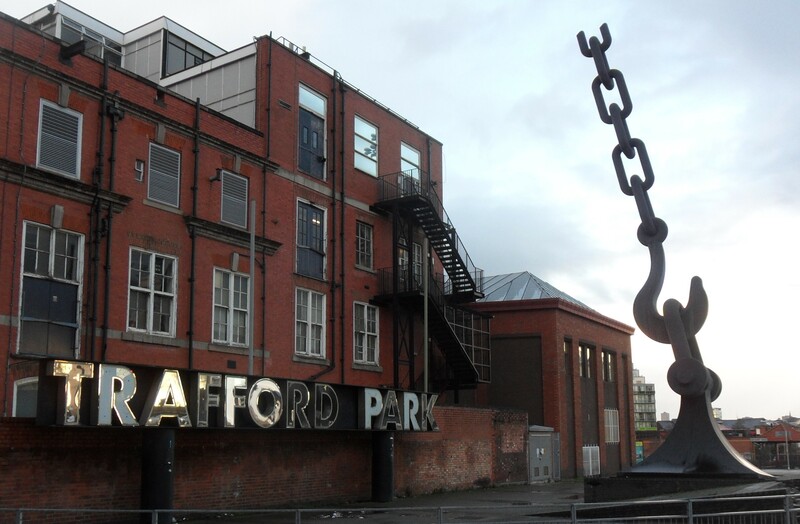 More of the canal’s industrial past came round the next corner in the shape of the famous Anderton Boat Lift. The River Weaver 50ft below navigates into the Mersey at Frodsham and originally salt and coal were sent down on chutes and inclines from the canal. As traffic increased the lift was designed and opened in 1875, working on a double hydraulic system until updated to electric at the beginning of the 20th century. It was declared structurally unsafe in 1983 but eventually has been restored, this time using a hydraulic oil system, and was reopened in 2002. An amazing feat of engineering. By now the threatened rain and wind had arrived but my saviour for the day was a great little cafe hidden away in their visitor centre which deserves a mention. What’s more is that they had a sale on in their bookshop. Looks a good trip here with the grand-kids when the lift is operating. 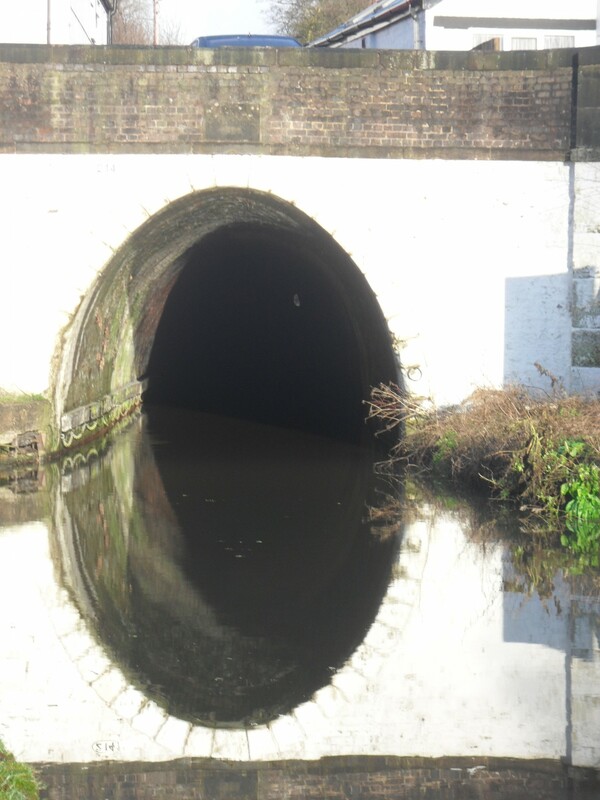 Two canal tunnels followed, the Barnton, 572yds and the Saltersford, 424yds, apparently some of the first attempts at canal tunnelling. They are both narrow and there is a rota system for boats to pass through, I of course went over as there is no towpath. Between the two is an idyllic basin where I came across this chap fishing in the pouring rain. I don’t usually find fishermen particularly chatty as they are concentrating on the line. My response from him when I tried to start a conversation was a terse “better than sitting at home”. In a couple of miles I had completed the Ring at Acton Bridge, if I’d carried on a little further I might have come across the section of trekking pole I lost in January. Drying out over a drink in the nearby Leigh Arms i had time to contemplate this enjoyable four day canal walk. 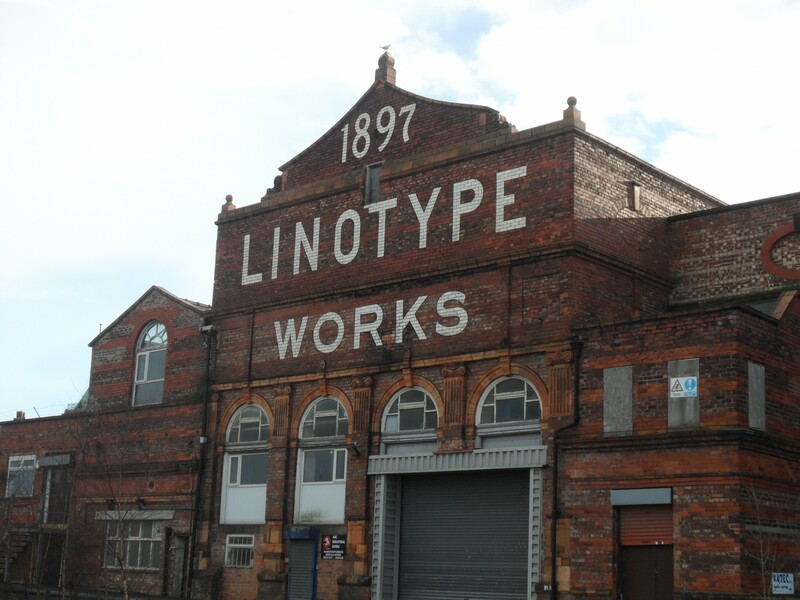 Full of interest both places and people, an insight into our industrial past, a good surface for walking at this time of year whatever the weather – all in all better than staying at home. On guard! This entry was posted in Cheshire Ring Walk, Long Distance Walks., Walking. and tagged Canals, Cheshire Ring Walk, Long Distance Walks, Walking. on December 2, 2015 by bowlandclimber. CHESHIRE RING WALK. Southern section – Day 3. Clear blue skies welcomed the day but heavy rain was forecast for the afternoon, so I won’t be hanging around. 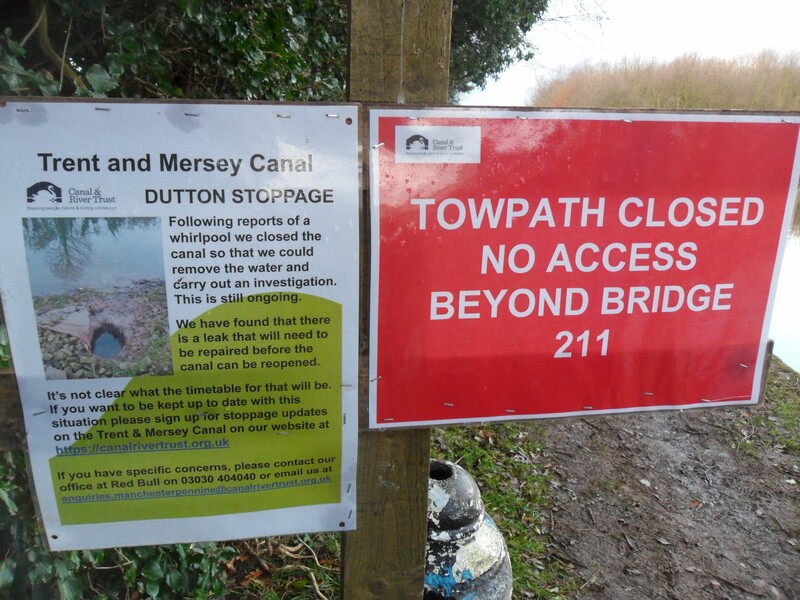 The canal basins in Kidsgrove were navigated and the correct towpath chosen, it’s not that difficult to set off on the wrong canal. 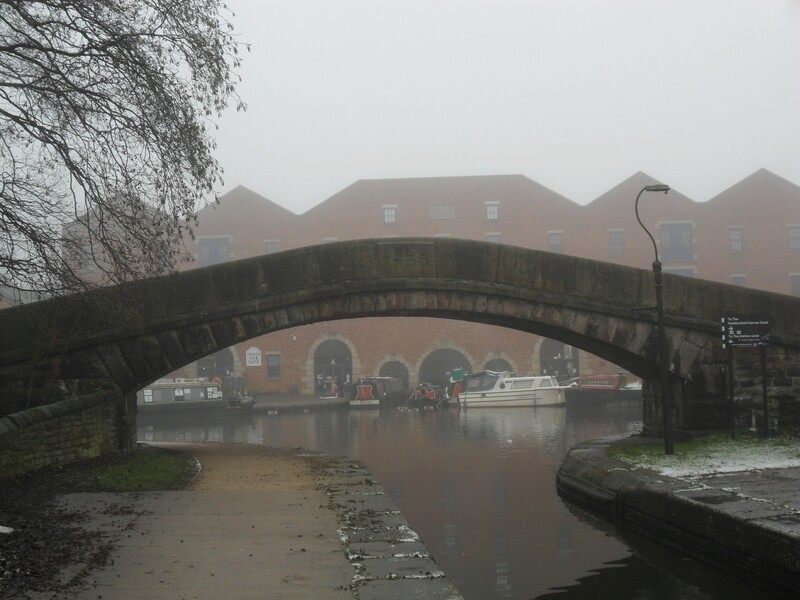 The Trent and Mersey is a much larger canal and for the most part has double locks. I was rather dismayed at its ‘mustard’ colour this morning, suspecting pollution, but I was told later that it was rust from the Kidsgrove Tunnel. As countryside was reached, now back in Cheshire, there was a view of Mow Cop Castle a folly built in 1754, again a reminder of my previous Gritstone Trail walk. 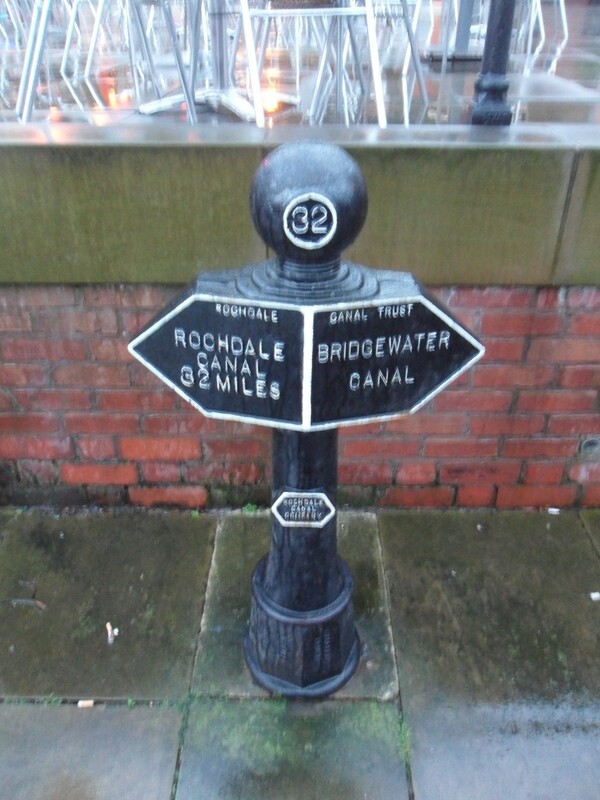 The mile posts on this canal are metal in contrast to the stone on the Macclesfield, giving a different feel to the banks. Still they prove so useful in determining your whereabouts and progress. Locks were being repaired and stretches of the canal closed so there was not much boat life today and I made quicker progress. Double locks dropped the canal down further and the countryside improved. In parts there were badger sets in the earth on the far bank, I wonder whether Badgers can swim. Pretty canal side cottages were passed. The busy M6 crossed overhead, a complete contrast to down here. At Wheelock I was ready for a sit down and a brew, the pub didn’t open till 4pm but today’s saviour came in the shape of Liz’s Plaice down the road where a mug of tea was 60p. Deserves a mention. Skirting Sandbach the signs of old abandoned chemical works and salt mining became more evident and the landscape took on a flat desolate appearance. Some areas were being redeveloped for masses of Belway housing [other builders are available] but they were hemmed in by industry and train lines – not ideal. 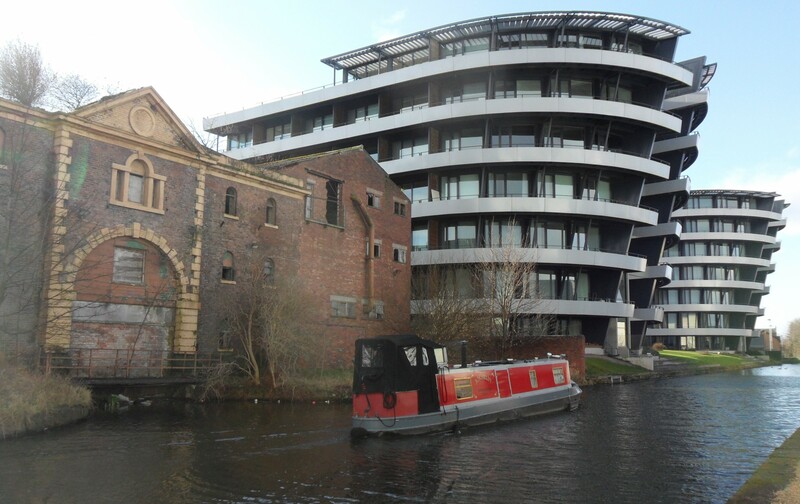 But I did think this more upmarket housing by the canal was attractive. 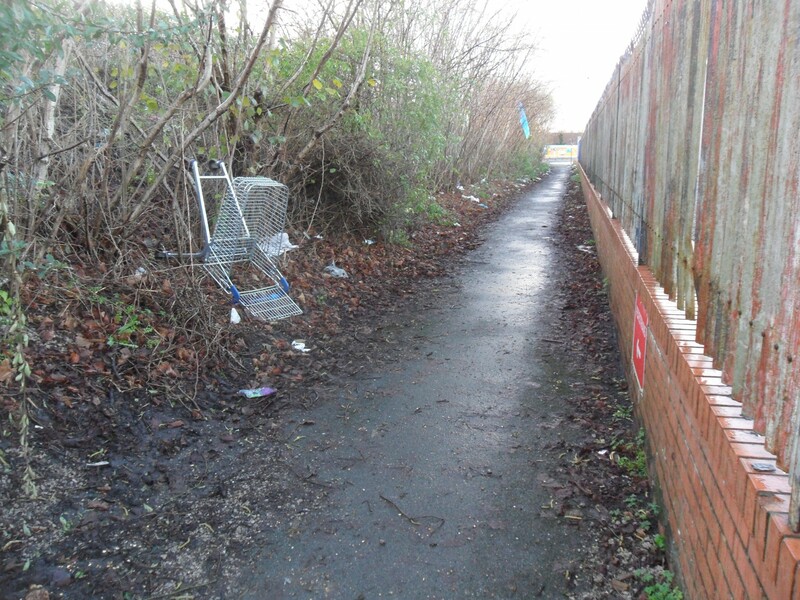 The walk deteriorated with a busy main road running alongside and more dereliction on the way into Middlewich. A fairly miserable few miles which I passed through quickly with one eye on the weather. At least I had a ‘welcoming committee’ on the outskirts of town. The canal in Middlewich was busy with locks, boat yards, wharves and holiday cruisers moored up, must be hectic in the summer. Within 15mins of arriving at my lodgings the heavens opened and did so most of the night. This entry was posted in Cheshire Ring Walk, Long Distance Walks., Walking. 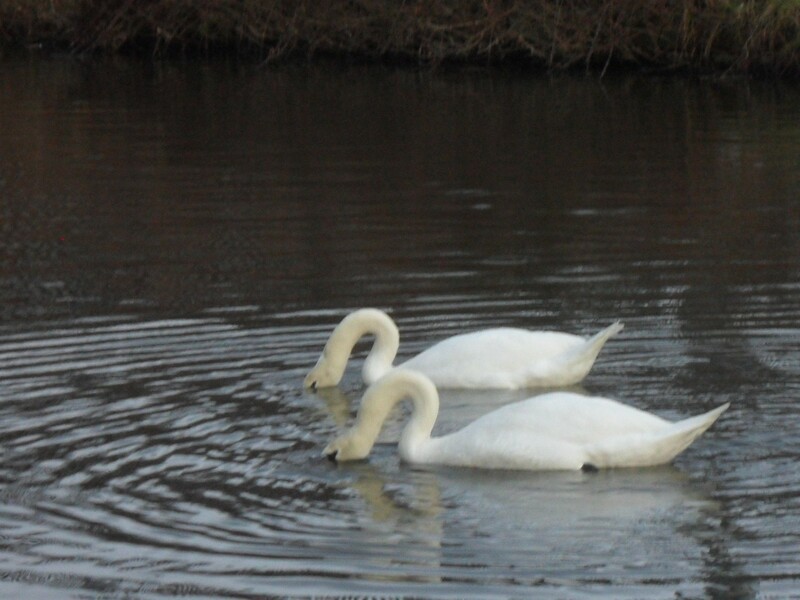 and tagged Canals, Cheshire Ring Walk, Long Distance Walks, Walking. on December 1, 2015 by bowlandclimber. CHESHIRE RING WALK. Southern section – Day 2. 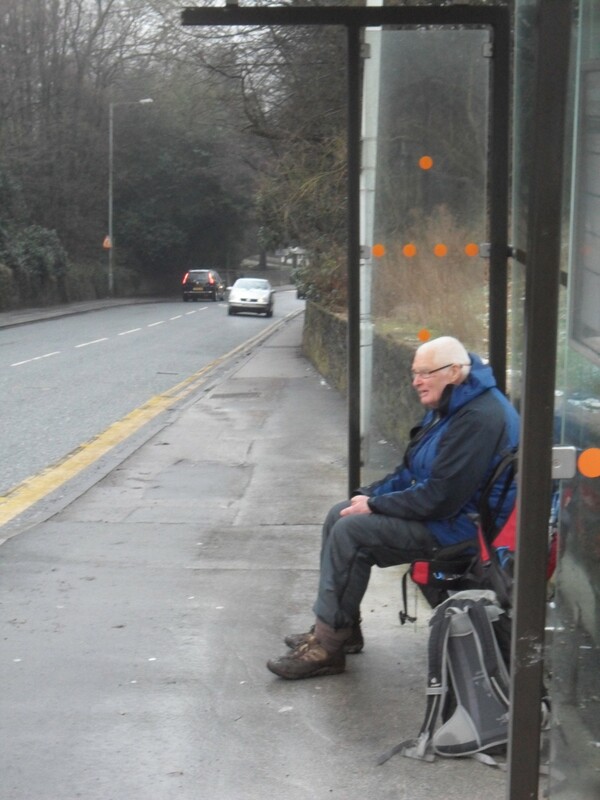 Yesterday I had walked past Macclesfield for 2 or 3 miles to make today shorter., My taxi back to that point was waiting for me at 7.30am, a nice bloke – Polish of course. He had started work at 6am having driven from his home town of Bury. His main complaint with working in this country [he’d been here for 6 years] was our regional accents, he has difficulty with Scousers and thinks Glaswegians sound Chinese. I can sympathise. The Macclesfield Canal has some lovely features. The original milestones were hidden in the war to confuse any invaders. 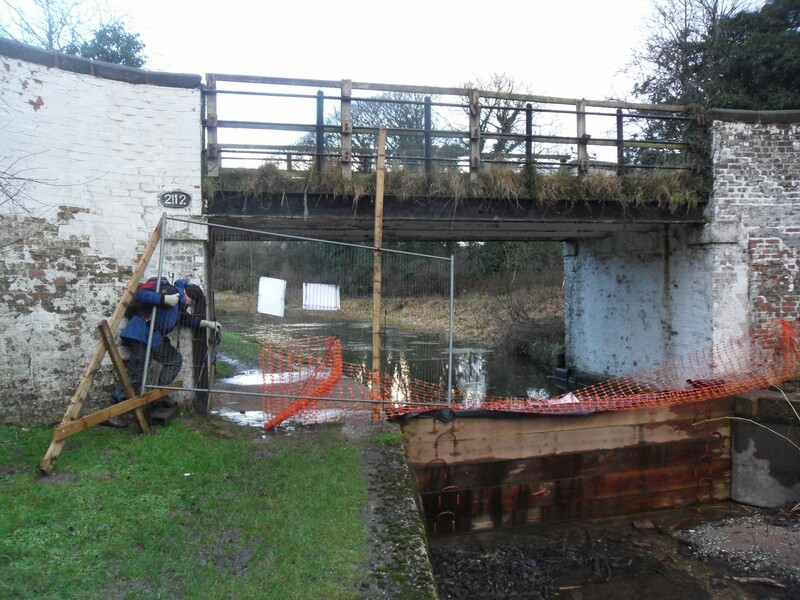 The Canal Trust has restored as many as possible as well as some 1/2 mile stones. 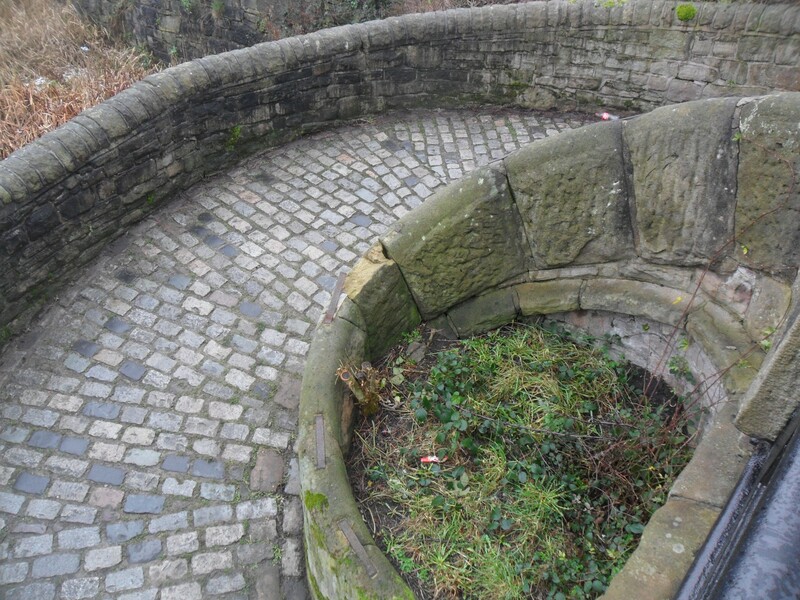 The canal is known for its several ‘roving bridges’ with spiral ramps for the horses to avoid unhitching when changing tow-path sides. 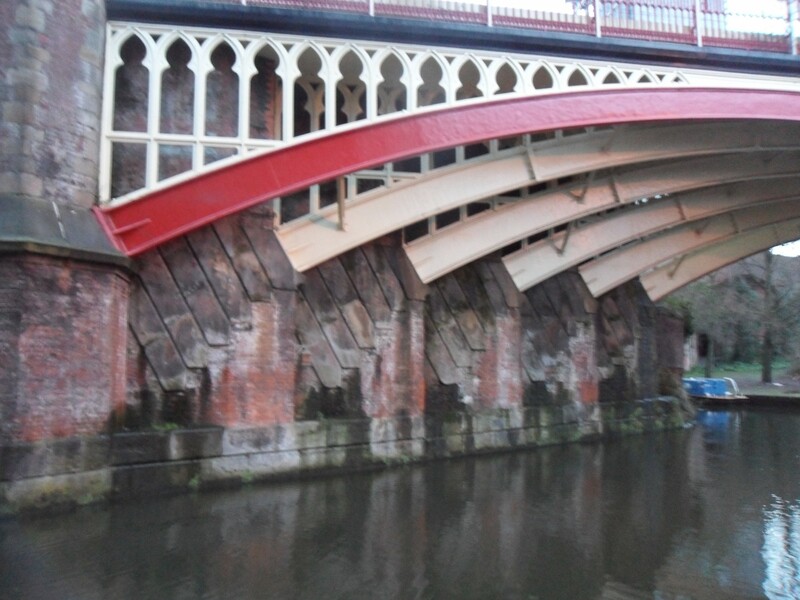 Also known as ‘snake bridges’ they are of beautiful construction. Just think about the logic behind their beautiful design. Rural Cheshire countryside passed by but the surrounding hills of Macclesfield Forest were invisible. Several properties had their own moorings. I got to thinking whether when they wanted a shopping trip do they take the boat or a canoe down to Tescos? Soon I was at the top of the12 Bosley Locks taking the canal down 118ft. Bosley Cloud from where the stone was quarried was in the cloud somewhere. 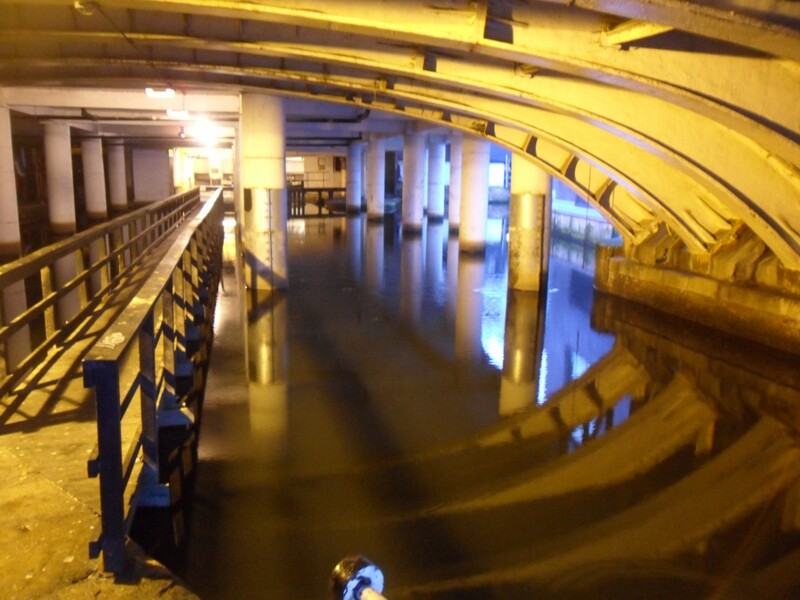 The locks had an ingenious function of half emptying into side tanks which saved water when refilling for the next boat. 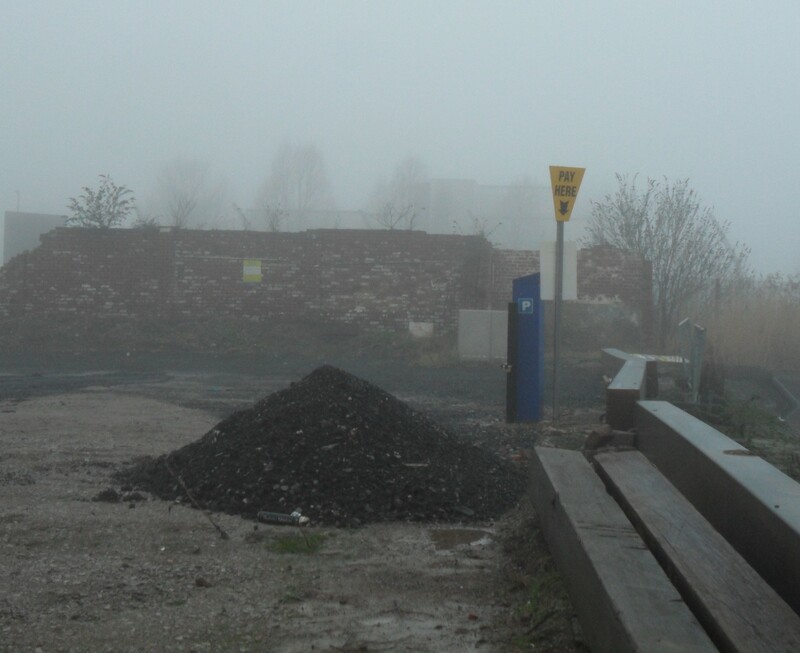 The urban side of Congleton appeared out of the mist. My hope for a hot drink was dinted when I realised the town centre was a good distance, however when I emerged onto the road there was a sandwich shop and they kindly found me a seat whilst I enjoyed tea and a freshly baked pastry. They were very friendly and were baking some wonderful food for the steady stream of customers coming to take away. Deserves a mention. There was a fine aqueduct and restored wharf as I left Congleton.The countryside round here is undulating and one has to marvel at the canal engineers skill of keeping dead level for miles. Quite a few aqueducts are crossed looking down onto roads or streams far below. One cannot really appreciate their architecture from up here but to drop down at every one for a better view – well I haven’t got all day. 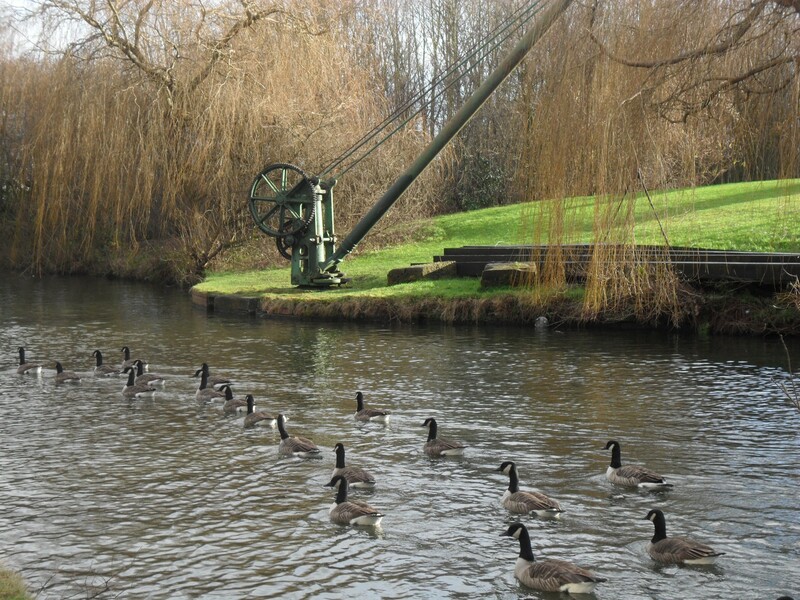 A row of drilled stone stanchions borders the canal, presumably connected by wire hawsers at one time. Further on are the more elegant railings at Ramsdell Hall where the canal cut across their front lawn, a kind of Ha-Ha. They have recently been restored to their former glory. The Macclesfield Canal continued for another 5miles, I was offered free coffee and biscuits at a canal side cottage, I must have been looking bedraggled. On through one small last lock to eventually cross the Trent and Mersey Canal [which I’ll follow for the next couple of days] and did a dog leg into complicated basins in Kidsgrove. Think I have walked into Staffordshire – the accents are different. The larger Trent and Mersey Canal. CHESHIRE RING WALK. Southern section – Day 1. 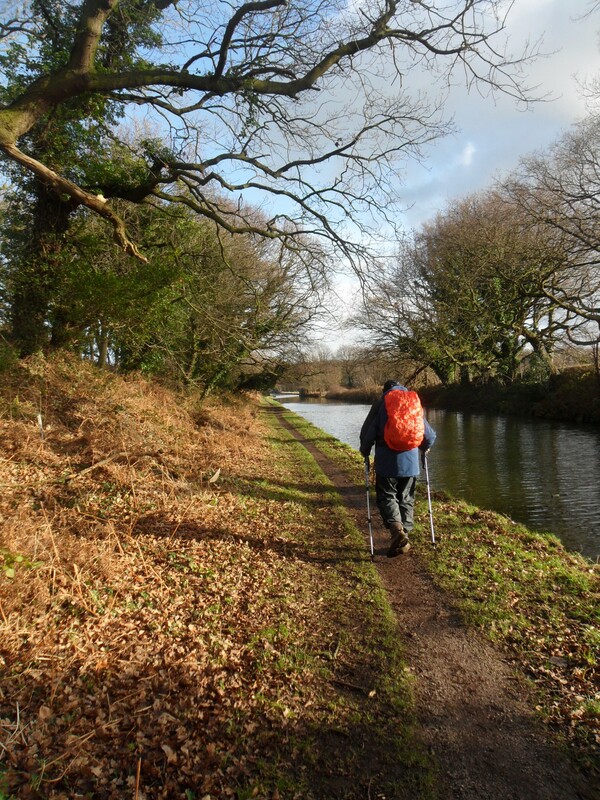 I walked with Conrad 3 days of the northern section of this trail earlier this year and I now hoped to complete the circuit on the Macclesfield Canal and then the Trent & Mersey Canal. 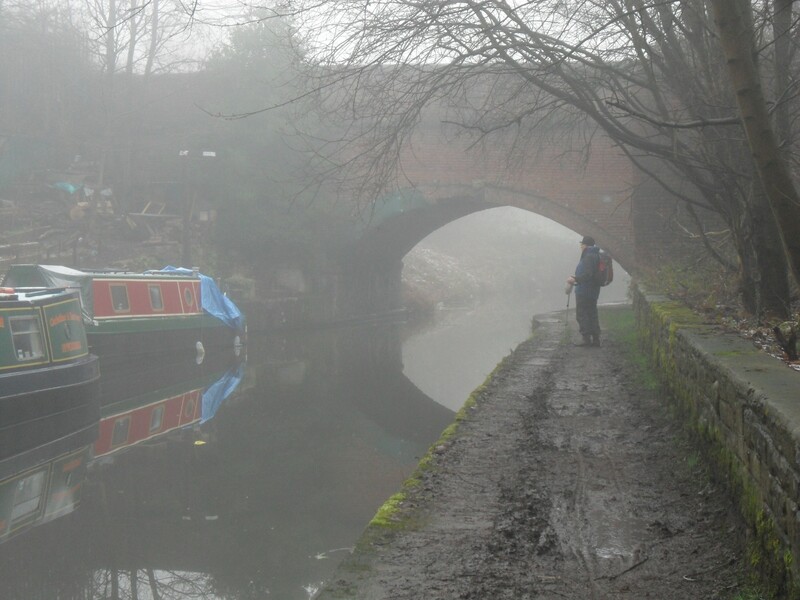 Murky weather greeted me at Marple where I was reunited with the last set of locks on the Peak Forest Canal leading up through the town to join the Macclesfield Canal. A brief detour found me in AngkorSoul, a Cambodian cafe fortunately serving good coffee with an eclectic background music mixture, had to tear myself away. Next time I would love to try their food. 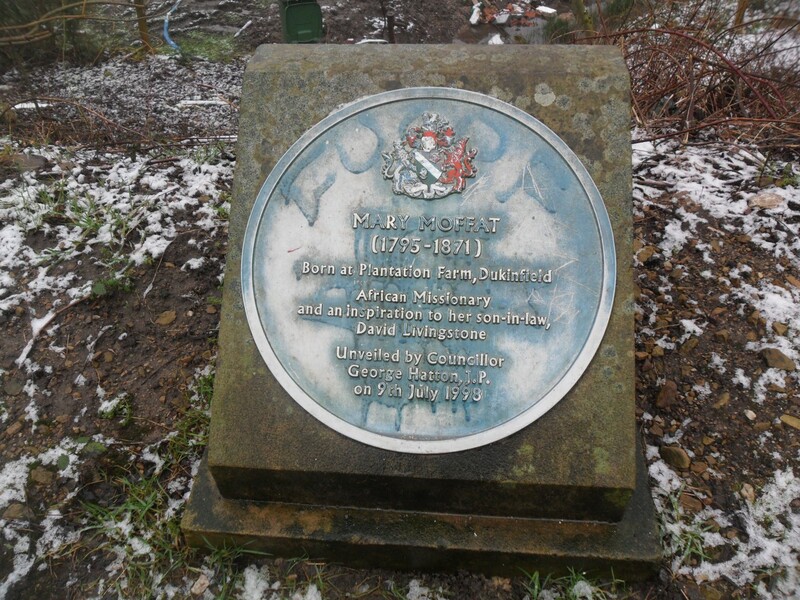 As a blue plaque states don’t miss Marple! 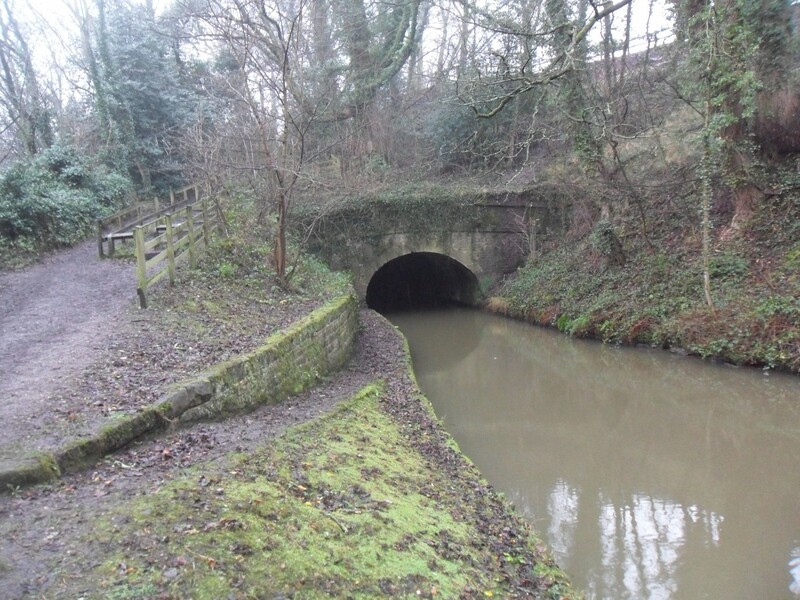 The Macclesfield Canal, surveyed by Thomas Telford as a direct route between the Potteries and Manchester, was one of the last narrow canals to be built, opening in 1831 just as the railways were starting. Goyt Mill is encountered early on, an impressive brick building spinning cotton till the 60’s when the Far East took over. Now, as many of these old mills do, it houses small businesses. On the outskirts of towns other small industries exist on the canal banks, they all look a little run down and usually involve breaking something. I was now striding out along the tow-path. This area seems popular with both permanent and passing canal boat types. 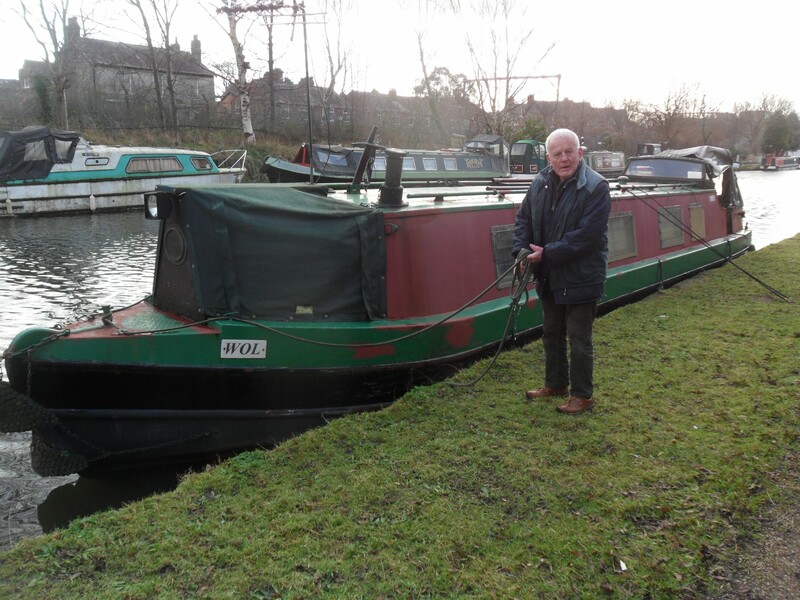 They all seemed keen to chat and I discovered the intricacies of mooring rules – 48hr, 2 weeks and more permanent moorings. Apparently satellites can now track your boat and where and for how long you moor up, somehow takes the romance out of the carefree life most of these people signed up for. A pleasant surprise came at bridge 15 – Bailey’s Trading Post, a chandler selling everything for the boat owner but more importantly serving coffee. Several walkers were resting up here so I joined them for the usual interesting chat. Long may these places thrive, deserves a mention. I had only gone 4miles and the morning was disappearing. Across the way I could see ‘The Cage Tower’ in Lyme Park, something to do with hunting, and further on ‘White Nancy’, commemorating the Battle of Waterloo, on a hill above Bollington. The Cage in distant Lyme Park. I remember walking along the ridge between them many years ago on, I think, the Gritstone Trail. Wherever I go these days my past seems to catch up with me. Further down the pleasant rural canal I came across two fishermen. The first was a stately Heron who allowed me unusually close before drifting off….. ….. the second was an excited man who had just caught a 12lb pike, what a beauty it was too but I wouldn’t like to get too close to its teeth. Two more large mills were passed as I strolled into Bollington, the Clarence and the Adelphi. They were originally cotton but have since had chequered histories, both now host small businesses but have been involved in silk, parachutes and car safety belts. Near here in 1912 the canal broke it’s banks flooding the town with water and fish. There is a choice of restaurants tonight ?Indian ?Thai ?Italian and about fifty pubs – it is that sort of town. This entry was posted in Cheshire Ring Walk, Long Distance Walks., Walking. 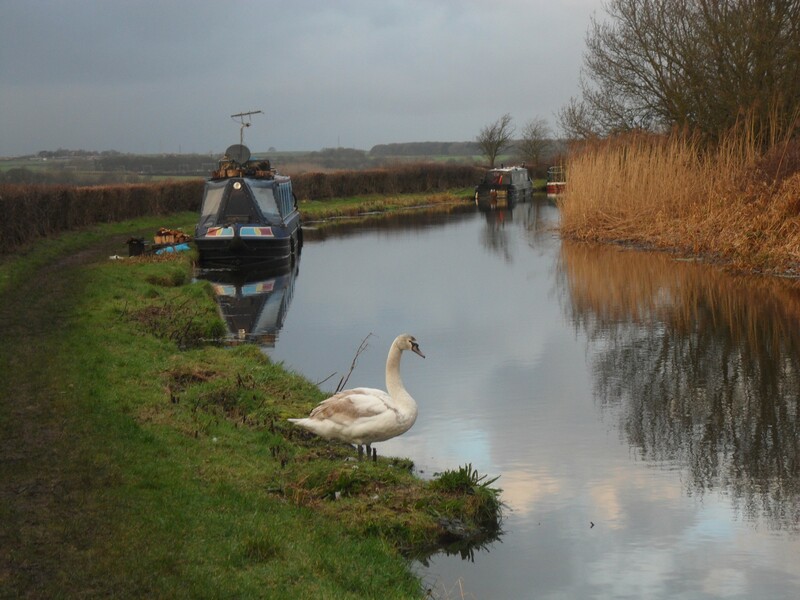 and tagged Canals, Cheshire Ring Walk, Long Distance Walks, Walking. on November 30, 2015 by bowlandclimber. 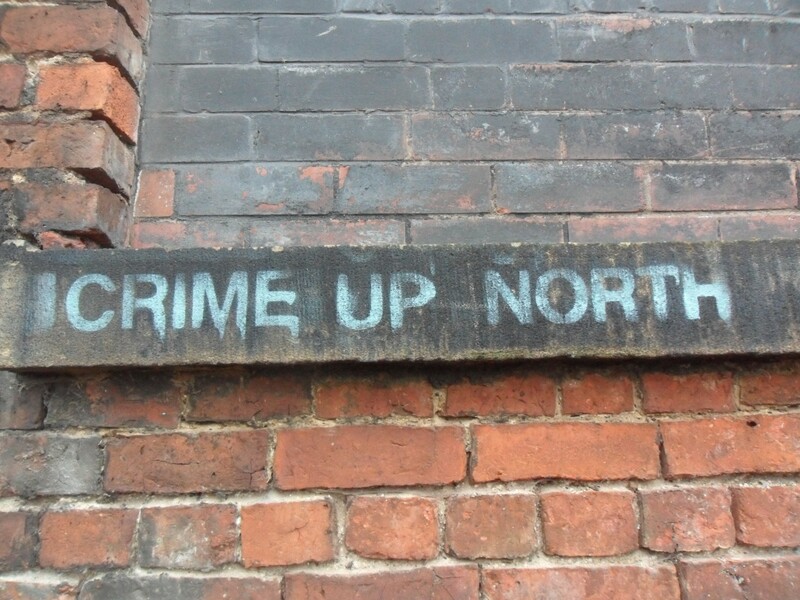 Manchester City Centre – Marple. In the mist an almost ghostly early journey on the Tram brought us back to Piccadilly. We disappeared underground where we had popped out last night, a few drunks were still staggering about from their all night session. In the depths water was rushing around us in numerous leats and escaping from leaky locks – audibly very similar to a caving trip in the Yorkshire Dales. 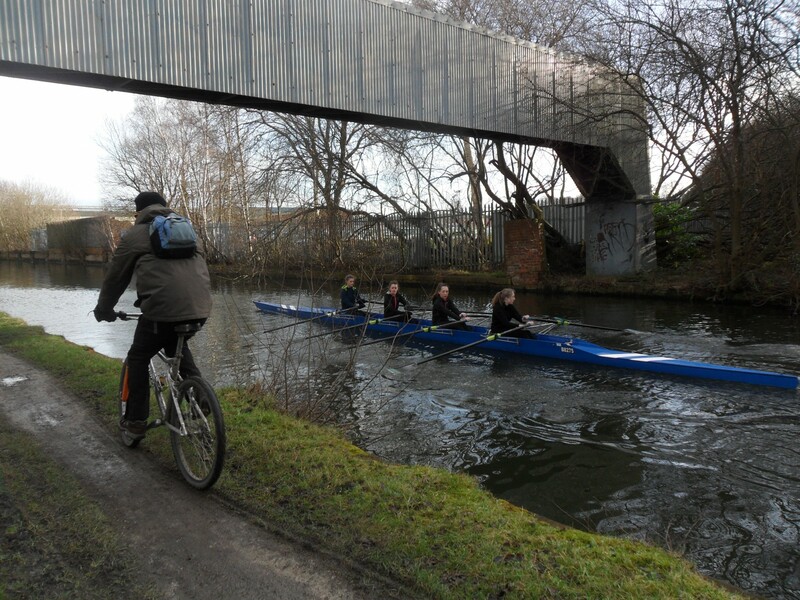 Things improved when we left the Rochdale Canal and doglegged into the Ashton. New canalside developments seemed habitable, warehouse conversions or twee town houses with all the usual little balconies. This is Manchester – how often do you sit and sip your cocktails in the evening? The freezing mist persisted. 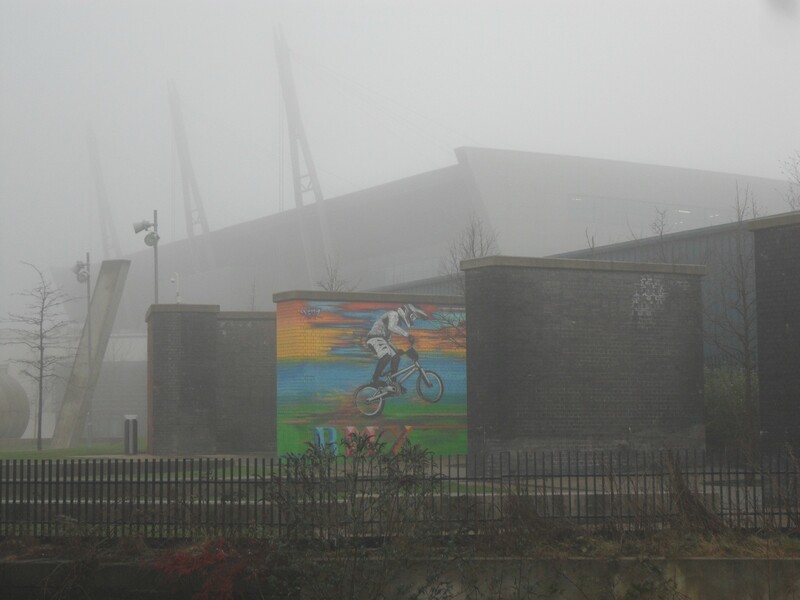 I was disappointed not to see much of the Etihad Stadium or the Velodrome and attached BMX course where one of my Grandsons would be trying to break something on his bike or himself. 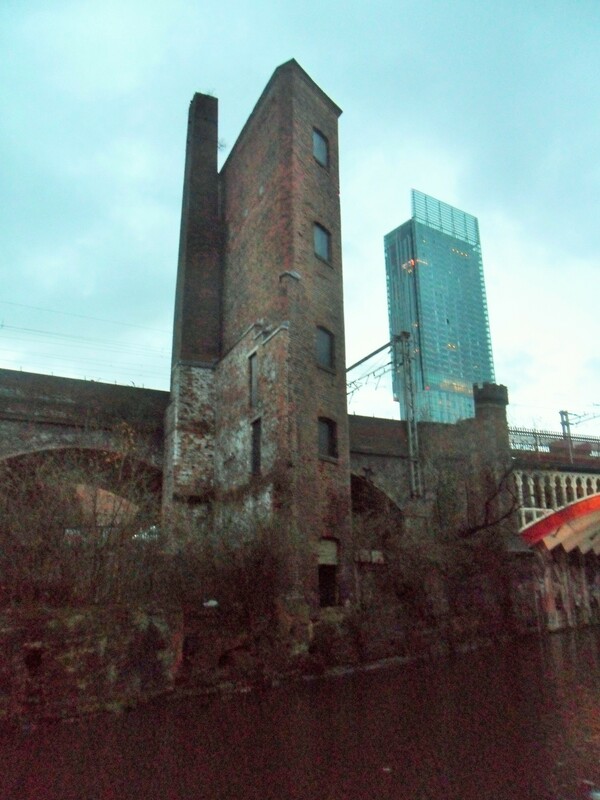 This is a part of Manchester I don’t know and we passed quickly through the suburbs past a series of locks towards Dukinfield. There were no boats using this stretch and because of the mist we didn’t see very much. The Portland Basin at Dukinfield where we branched onto the Peak Forest canal looked popular, there was a cafe and museum, but as they were on the opposite bank and we were on a tight schedule we pressed on. More people started appearing, mainly dog walkers, as we contoured high above the wooded Tame valley. Our lunch stop sat on a stone wall coincided with the start of a snow storm! Old walled bridle ways linked up with unseen 19th century industrial sites below. A quick visit to a road above in ? ?Hyde [the home of Harold] produced an Aldi and The Cheshire Ring pub. After bypassing a tunnel we were now walking above the attractive Goyt Valley and more people [and their dogs] were taking their Sunday exercise. 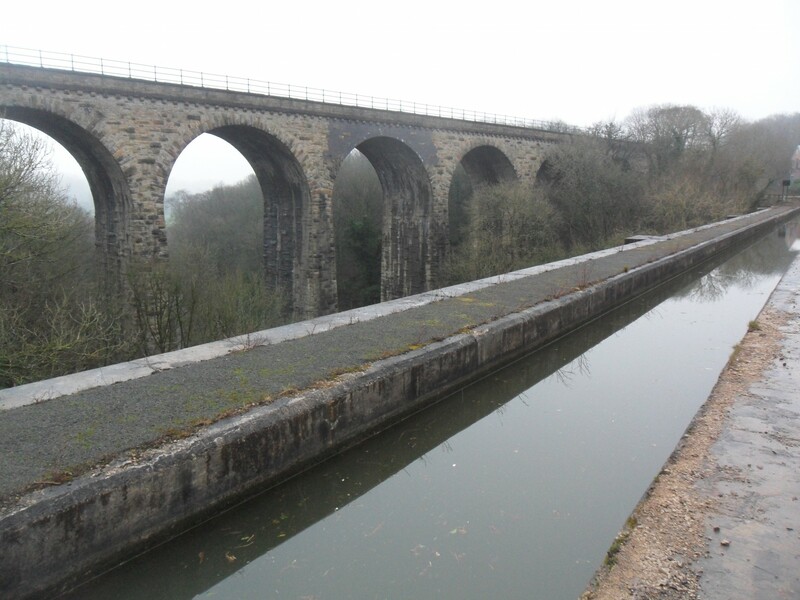 The Marple Goyt Aqueduct was the next attraction, a hundred foot high, with an exposed canalside. Probably best seen from below. Thinking we were dropping into Marple we were surprised to find a series of 9 locks taking us up to the road near the station. Our train wasn’t due for an hour so we hopped on a bus to Stockport and another to Altrincham and another to Timperley, didn’t cost us a penny! Thanks Conrad. I’m keen to complete the circle now but that will have to wait till I arrive back from hotter climes. 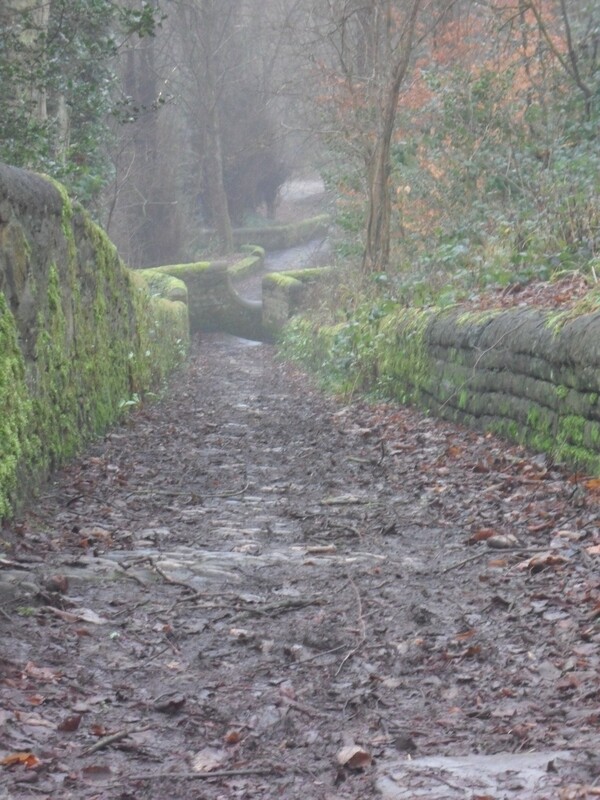 This entry was posted in Cheshire Ring Walk, Long Distance Walks., Walking. and tagged Canals, Cheshire Ring Walk, Long Distance Walks, Walking. on January 21, 2015 by bowlandclimber. CHESHIRE RING WALK – Northern Section, day 2. Lymm – Manchester City centre. ‘Overhead, the light is fading. 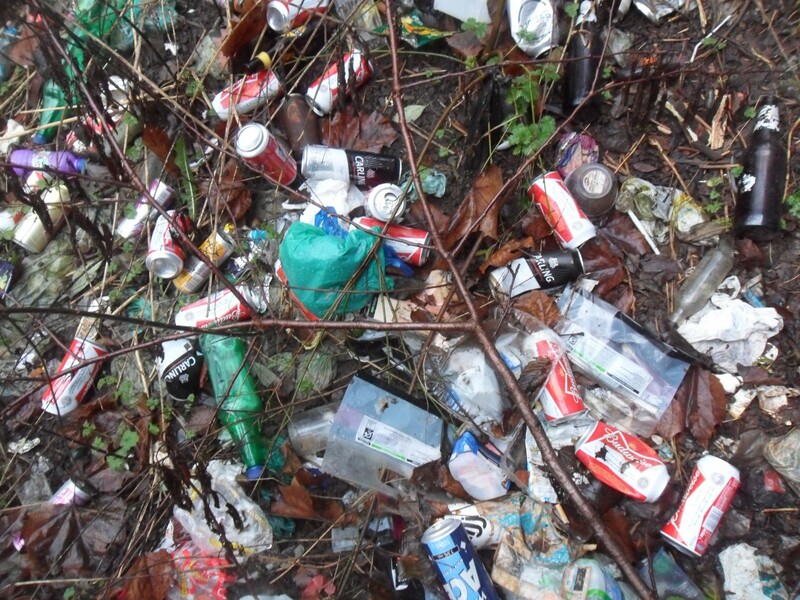 Below, in the murky water, bubbles rise and burst amid a sludge littered with debris from nights gone by: takeaway boxes, empty beer cans, condom wrappers, needles. 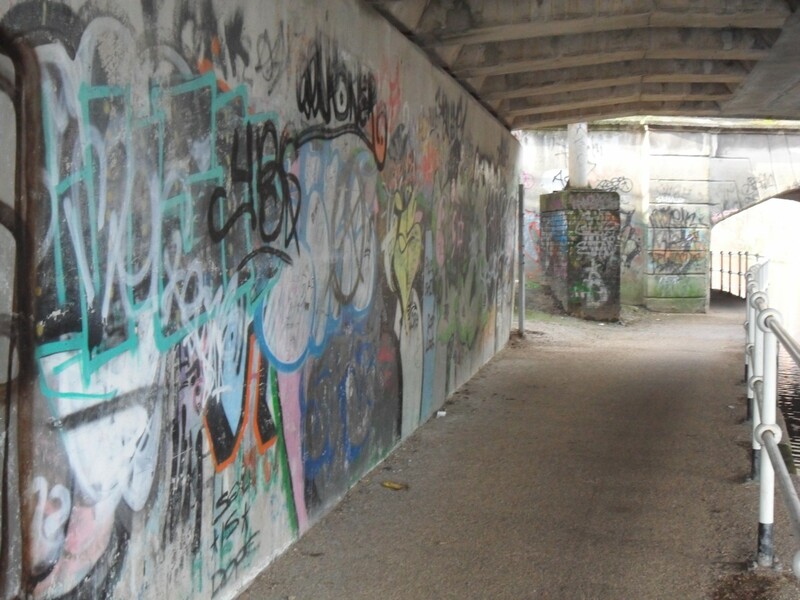 The walkway is dotted with tunnels, low-hanging and cobwebbed, where shadows lurk beyond the reach of street lights and the air is heavy with the stench of decay.’ Sarah Rainey writing in the Daily Telegraph. 16 Jan 2015. 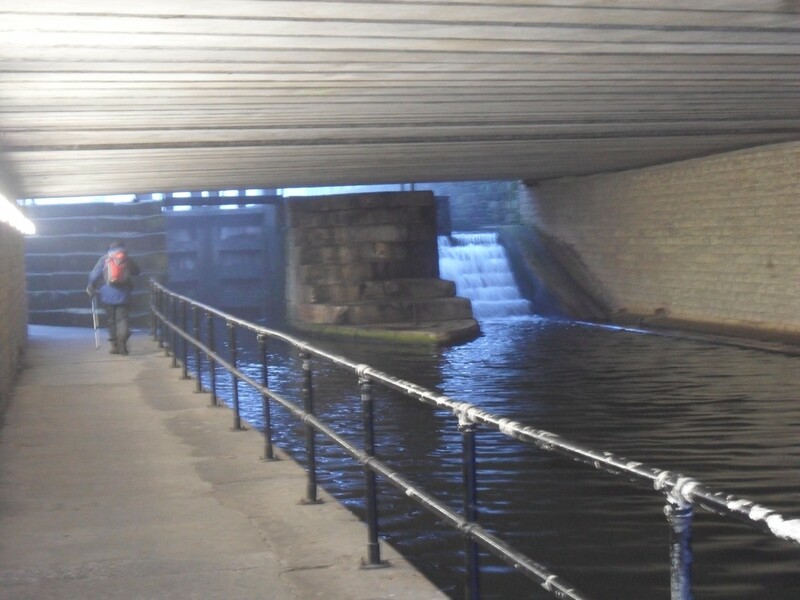 Her article rather melodramatically discussed the possibility of a serial killer, nicknamed “The Pusher”, stalking these Manchester canals. 61 bodies in 6 years is the tally, some have met a violent end but others were probably inebriated. 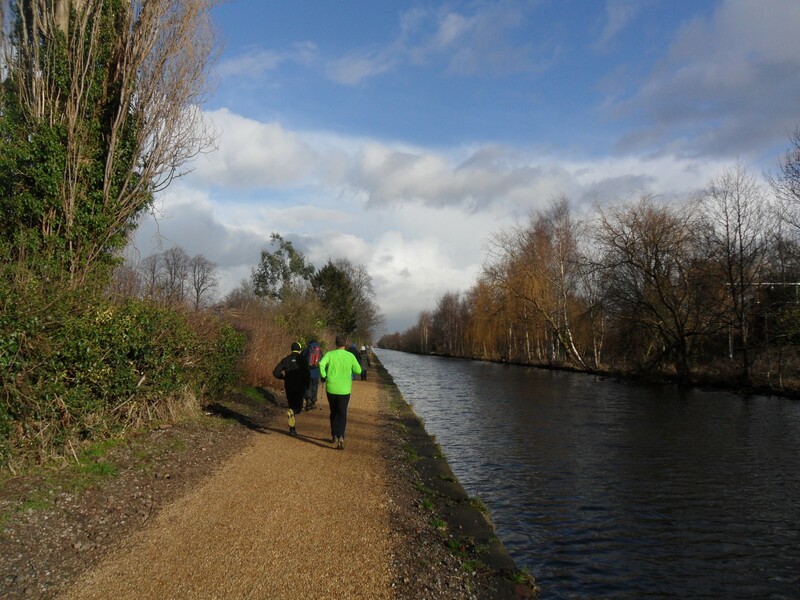 As we rejoined the Bridgewater canal at Lymm on a sunny and frosty day these thoughts never crossed our minds. An interesting and varied morning lay ahead on this well used section of canal. 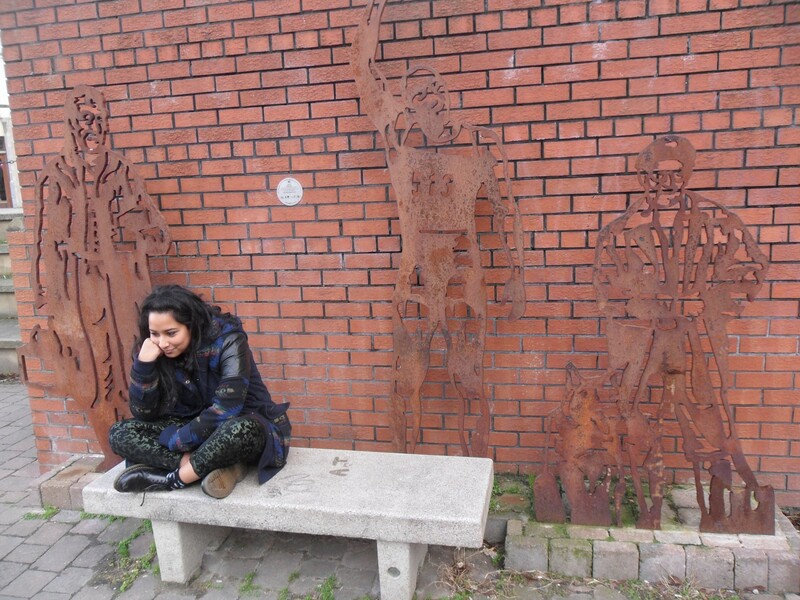 Things changed in the afternoon as we entered Stretford, the graffiti and litter increased and we felt alone. 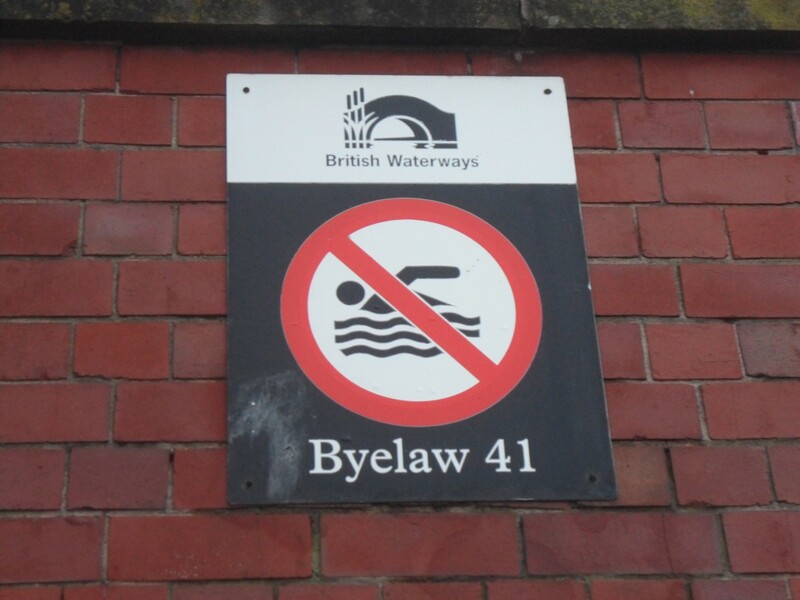 The tow-path was completely barred [even for us] near Old Trafford Stadium necessitating an unpleasant road diversion only to find ourselves in no man’s land on the wrong side of the canal in a dingy area. Perhaps the anxiety contributed to Conrad taking a nose dive into the concrete, he was lucky to come up with only scalp bruising and twisted glasses. 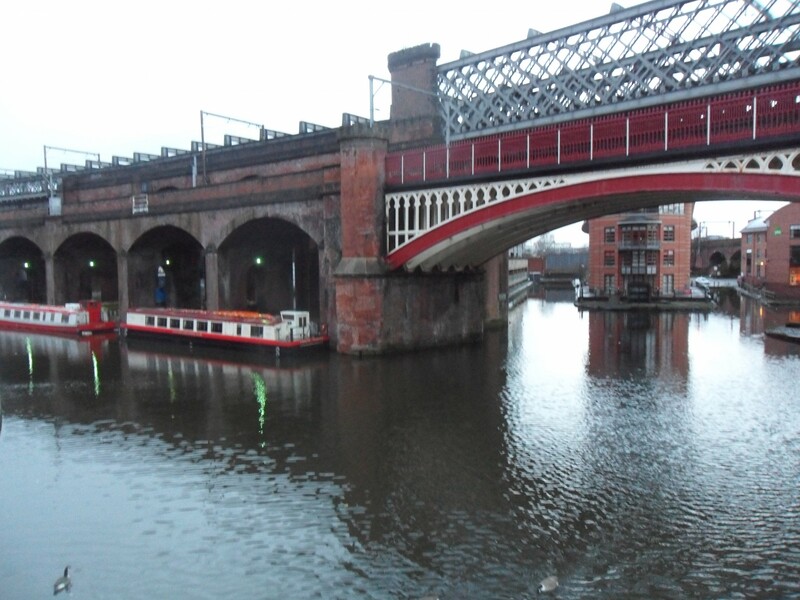 We made our escape to the gentrified Castlefield area all the time marvelling at the complexity of the canals, their basins and the engineering skills that had created them. We were now on the Rochdale Canal. Areas with bright busy canalside cafes gave way to echoing subterranean passages with shadowy figures, I found myself humming the Harry Lime theme. 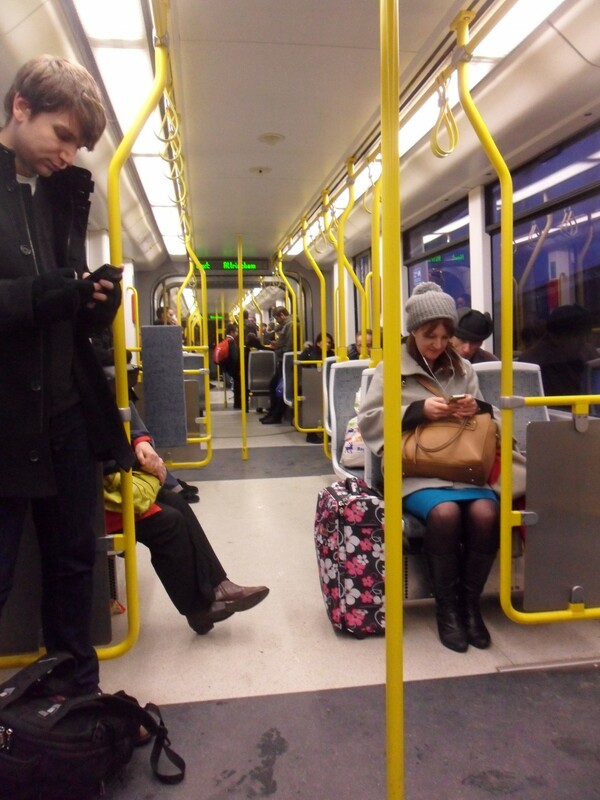 Eventually we emerged into the busy Canal Street and Piccadilly Station to catch the Metro tram to Altrincham, a first for us which left us impressed with the transport system. We survived to tell the tale. CHESHIRE RING WALK – Northern section, day 1. 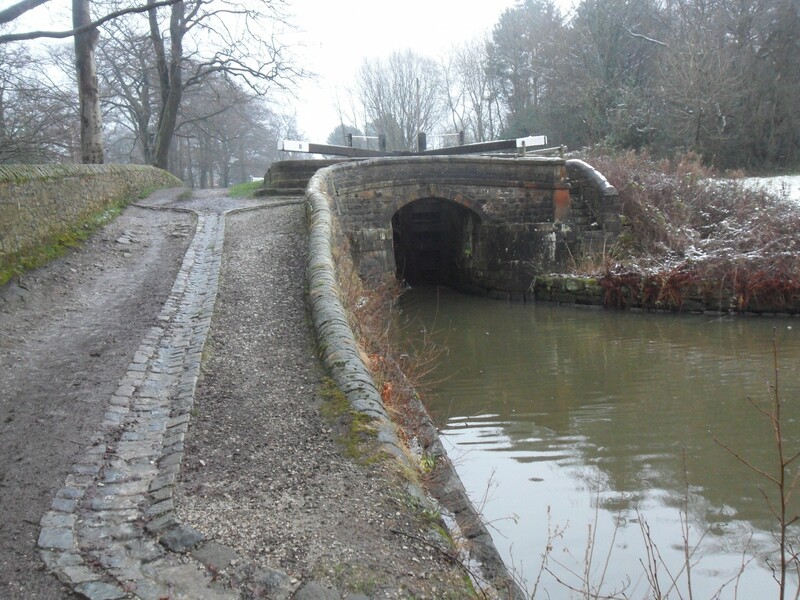 The Cheshire Ring is a 97mile circular canal route linking six canals. Trent and Mersey; Bridgewater; Rochdale; Ashton; Peak Forest and Macclesfield with a total of 92 locks. 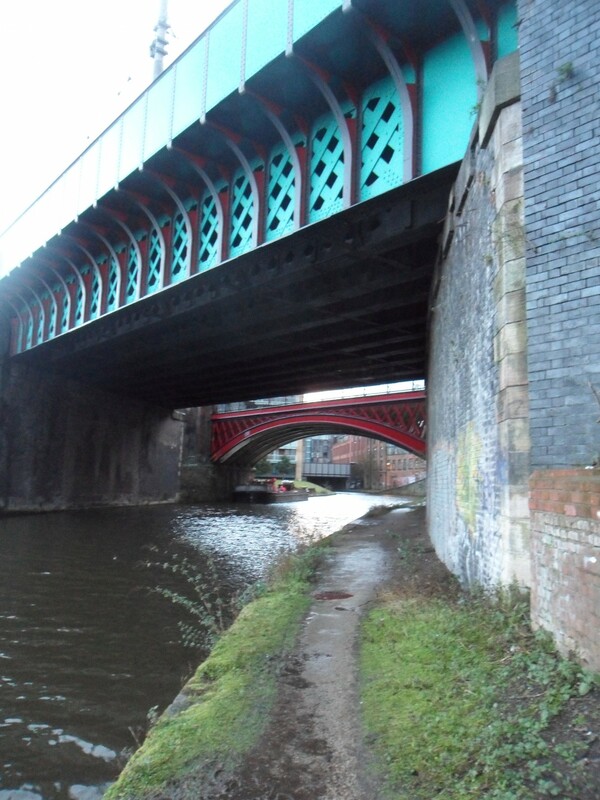 Somebody had the bright idea of using the tow-paths as a walking route, skirting the Pennines, passing through the Cheshire countryside, vast industrial areas and the city centre of Manchester. Conrad had already walked half last year but we teamed up for the Northern Stretch over three icy days this January, using my son’s house in Altrincham as a hub. 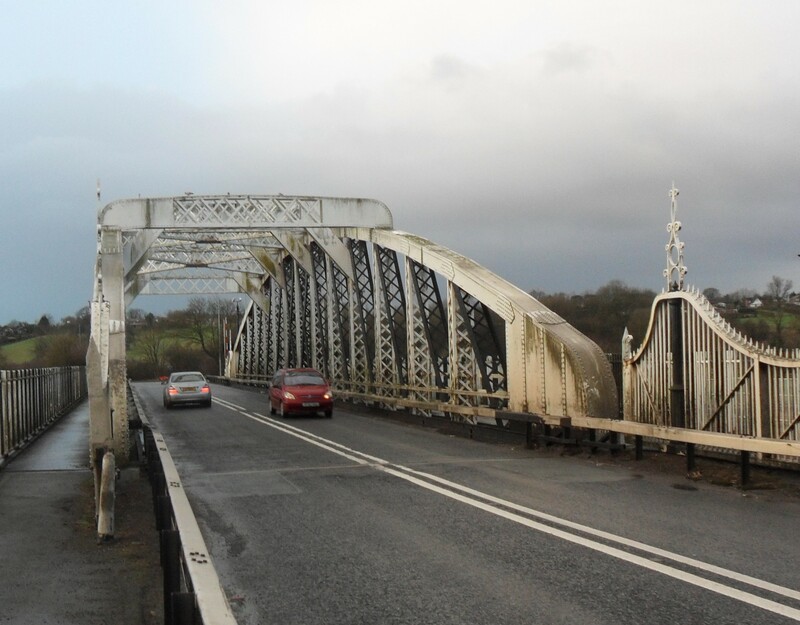 We were dropped by the Acton Swing Bridge which is actually on the navigable River Weaver, at this point close to the Trent and Mersey Canal where we joined the ring. Walking briskly to combat the cold we made good progress along the tow-path through rural Cheshire until confronted by an unexpected blockage. Undeterred we proceeded with only a little squeezing past barriers. 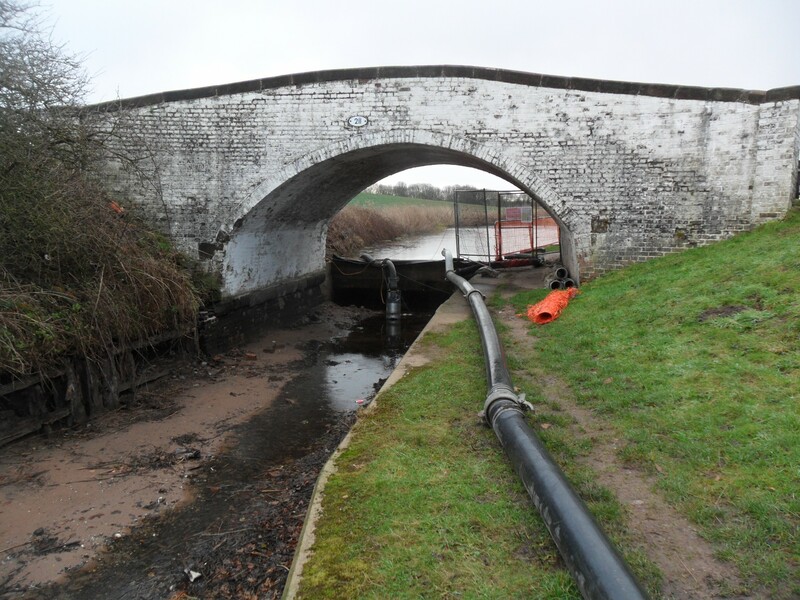 The canal had been drained in one section for repairs. 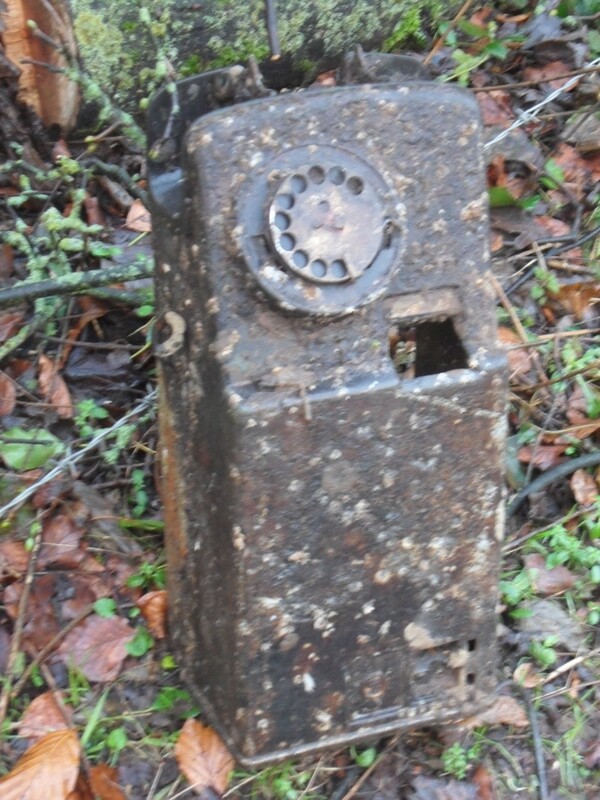 The weather took a turn for the worse with cold rain and the path more muddy, reaching for my poles I discovered the lower section of one had dropped out at some stage but there was no point in returning to search. Sad after 20 or more years of faithful use. 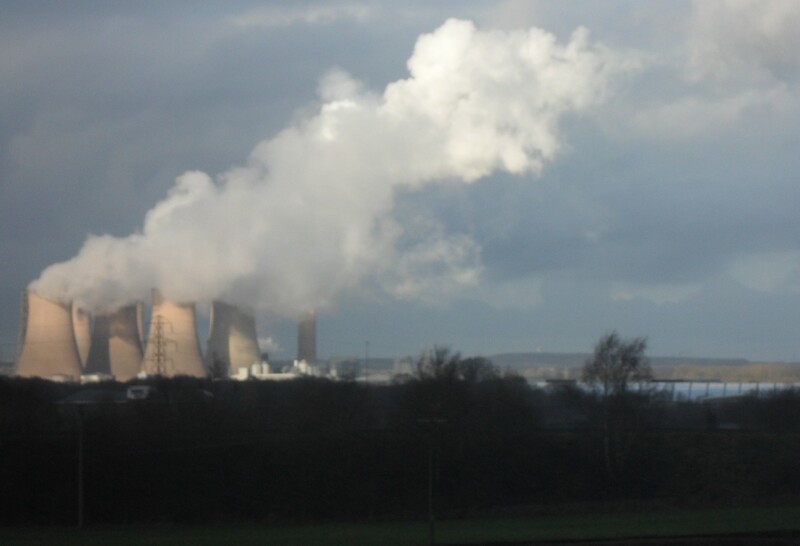 A tunnel without a tow-path was climbed over, a kingfisher was spotted, we ducked under the M56, a seat found for lunch, Fiddler’s Ferry power station belched its steam.On the edge of Warrington we found an antiquated chandlers shop open and serving hot drinks from a machine. 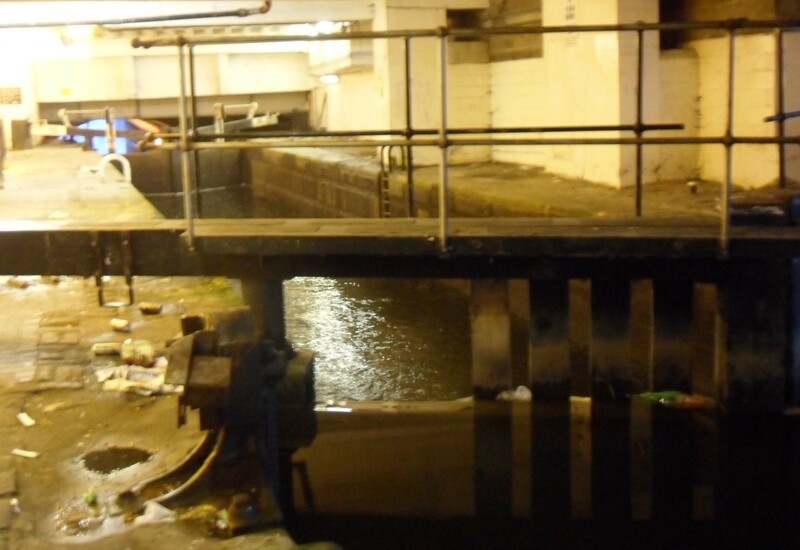 The owners were a font of canal tales and warned us to be wary tomorrow of local youths causing problems where the canal winds through the city. 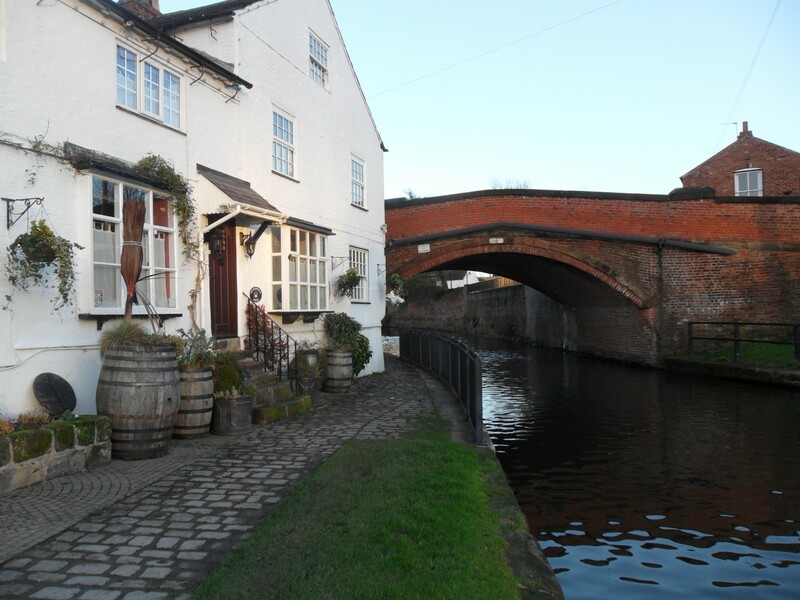 From there it became more Cheshire-like to finish in the sandstone town of Lymm. A full day and what with all the slipping about in the mud I felt tired enough to ponder two more days of the same. A bus meandered through the countryside back to Altrincham. This entry was posted in Cheshire Ring Walk, Long Distance Walks., Walking. and tagged Canals, Cheshire Ring Walk, Long Distance Walks, Walking. on January 20, 2015 by bowlandclimber.